My name's Tony and I would like to invite you to come hang out with us. We're just a group of car enthusiasts, of all ages, that get together every Sunday and talk about cars and stuff. We've been doing it for almost three years now. It started as a 240sx get together, but times have changed, we've evolved, and people bring all different types of cars. Mostly, we all share a love of RWD sport compacts, so we have a lot of Nissan's, Mazda's, and Toyota's in the group, but we're very open minded. On occasion, I'll even show up ridin' my scooter. We love to talk about rotaries. My old roomate Greg has a beautiful, red '87 Turbo II and my other old roomate Don used to have an FD. 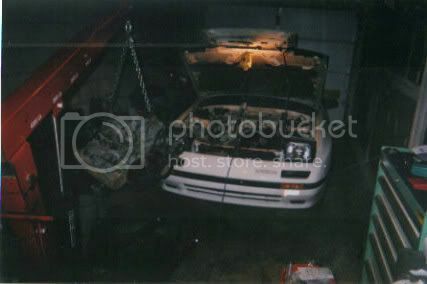 However, it was stolen, so now he's got a sick turbo 240sx. My other friend Jon has a pristine S5 convertible. A little over a year ago, I picked up a RX-7 myself. My "project" is a '88 RX-7 GXL. I bought it off a friend for $800. The body was in great shape, but the engine had a blown rear rotor. Last August I transplanted a junkyard motor into it, but ran into some electrical problems. This project is currently on hold because I just bought a house in October and I'm fixing up the basement. I should be redoing the garage in a month or two, which should get me back on track. So now that you've gotten to know us, please stop by and hang out. We're less than an hour from Baltimore, Trenton, or Philly. We meet every Sunday (except holidays) at 7:00pm. We all meet in front of Rita's Water Ice and usually B.S. for an hour and then go out to eat.